Rice was the first of six children born to Charles Rice and Louisa Newmeyer. Charles and Louisa married about two months after his birth. He grew up in various towns near Morocco, Indiana, on the Indiana-Illinois border, and considered Morocco, Indiana, his hometown. He was known as "Eddie" during his childhood. In 1908, Rice married 16-year-old Beulah Stam. They lived in Watseka, where Rice ran the family farm, worked at several jobs in the area, and attended tryouts for various professional baseball teams. In 1919, Rice played in 141 games and hit .321, one of 13 seasons in which he hit at least .300. He hit .338 in 1920, recorded a league-leading and career-high 63 stolen bases and was caught stealing a league-high 30 times. In 1921, he hit 13 triples, the first of ten consecutive seasons in which he finished in double digits in that category. He collected a league-high 216 hits in 1924. Though not the league leader in 1925, he recorded a career-high 227 hits, 87 rbi, and a .350 batting average, career highs among his full seasons. The most famous moment in Rice's career came on defense. During game three of the 1925 World Series with the Senators playing the Pittsburgh Pirates, the Senators were leading the Pirates 4–3. In the bottom of the 8th inning, Sam Rice was moved from center field to right field. With two outs in the bottom of the inning, Pirates catcher Earl Smith drove a ball to right-center field. Rice ran down the ball and appeared to catch the ball at the fence, potentially robbing Smith of a home run that would have tied the game. After the catch, Rice toppled over the top of the fence and into the stands, disappearing out of sight. When Rice reappeared, he had the ball in his glove and the umpire called the batter out. The umpire's explanation was that as soon as the catch was made the play was over, and so it did not matter where Rice ended up. His team lost the Series in seven games. Controversy persisted over whether Rice actually caught the ball and whether he kept possession of it. Rice himself would not tell, only answering: "The umpire called him out", when asked. Magazines offered to pay him for the story, but Rice turned them down, saying: "I don't need the money. The mystery is more fun." He would not even tell his wife or his daughter. The controversy became so great that Rice wrote a letter to be opened upon his death. The Senators held "Sam Rice Day" in late 1932, where the team presented him with several gifts, including a check for more than $2200 and a new Studebaker automobile. He played only 106 games that year, often appearing as a pinch hitter. In 1933, the team returned to the World Series. Though the team lost, Rice batted once in the third game, getting a hit. The Senators released him after the season. He played 1934 with the Cleveland Indians, then retired at the age of 44. Cleveland manager Walter Johnson talked to Rice about returning in 1935, but Rice refused. Rice retired with a .322 career average. He stood erect at the plate and used quick wrists to slash pitches to all fields. He never swung at the first pitch and seldom struck out, once completing a 616-at-bat season with nine strikeouts. As the ultimate contact man with the picture-perfect swing, Rice was never a home run threat, but his speed often turned singles into doubles, and his 1920 stolen base total of 63 earned him the timely nickname "Man o' War". With 2,987 hits, Rice has the most of any player not to reach 3,000. Rice later said, "The truth of the matter is I did not even know how many hits I had. 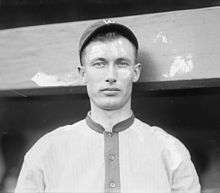 A couple of years after I quit, [Senators owner] Clark Griffith told me about it, and asked me if I'd care to have a comeback with the Senators and pick up those 13 hits. But I was out of shape, and didn't want to go through all that would have been necessary to make the effort. Nowadays, with radio and television announcers spouting records every time a player comes to bat, I would have known about my hits and probably would have stayed to make 3,000 of them." ↑ "Sam Rice Minor League Statistics & History". Baseball-Reference.com. Retrieved December 22, 2014. 1 2 3 4 "Sam Rice Statistics and History". Baseball-Reference.com. Retrieved December 21, 2014. 1 2 3 "Baseball Hall of Famer Sam Rice is dead at 84". Bangor Daily News. October 15, 1974. Retrieved December 21, 2014. ↑ Vosburgh, Ted (August 17, 1931). "Johnson leads in tribute to A's great club". Sarasota Herald-Tribune. Retrieved December 22, 2014. 1 2 Fleitz, David L. (April 3, 2007). More Ghosts in the Gallery: Another Sixteen Little-Known Greats at Cooperstown. McFarland. p. 87. ISBN 978-0-7864-8062-3. Retrieved December 21, 2014. ↑ The 3,000 Hit Club. Baseball Hall of Fame. Retrieved December 21, 2014. ↑ Eads, Jane (January 31, 1945). "200 Japanese-Americans work in important government jobs". The Palm Beach Post. Retrieved December 21, 2014. ↑ "Rixey, Sam Rice in Baseball Hall of Fame". Pittsburgh Post-Gazette. January 28, 1963. Retrieved December 21, 2014. ↑ "Rice claims he never lost ball". Ellensburg Daily Record. November 5, 1974. Retrieved December 21, 2014.